OASE AquaMax ECO Classic pumps are cost-effective filter pumps. Ideal for pond filters, streams and waterfalls. 5-year OASE warranty. 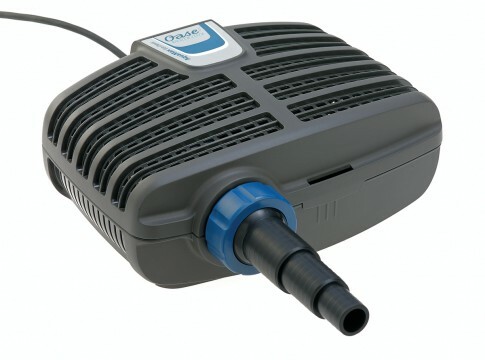 The OASE AquaMax Eco Classic pumps have proved hugely popular due to their low running costs and superb performance in ponds, streams and waterfalls. 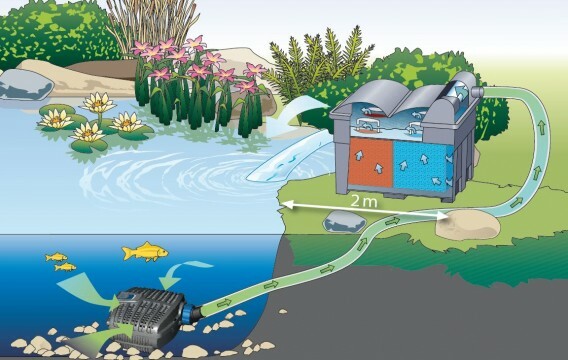 The Eco Classic are an excellent, cost-effective alternative to the AquaMax Eco Premium filter pumps if you do not intend to connect a 2nd point of suction to the pond and/or have a less demanding water feature. OASE Germany has invested heavily in the AquaMax pump ranges and the tried-and-tested Eco Classic has proven reliable and robust and as such, carry a full 5-year OASE Guarantee. Low power, high performance and unrivalled reliability. The OASE AquaMax Eco Classic are a range of pumps designed primarily for feeding water to pond filtration systems and supply of water to streams and waterfalls. These pumps are extremely efficient, using very little power for the output they deliver. This eco motor energy efficiency makes this range of pumps perfect for fish pond filtration pumping, where continuous year round circulation and pump reliability is essential for pond and fish health. There are 7 pump models in the AquaMax Eco Classic range with maximum flow rates ranging from 2,600 litres per hour to 17,400 litres per hour. AquaMax Eco Classic pumps feature a large surface strainer casing which enables particles up to 8mm in size to be passed. This solids handling capability prevents the pump from forever becoming blocked and ensures organic waste in the pond can be transferred to the filtration system. 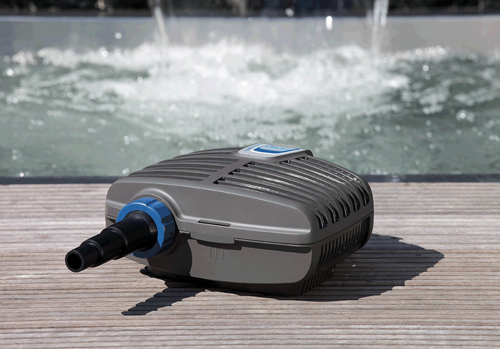 AquaMax Eco Classic pumps can be dry installed by flooded suction, or submerged directly in the pond underwater. The supplied hose tail fitting for inlet and outlet connections allow for angular rotation. Compatible hose sizes for these pumps are 25mm (1”), 32mm (1 ¼”) and 38mm (1 ½”) inside diameter. Environmental Control Function protects the pump from overheating and will shut the pump down in the event of dry running or excessive soiling/blockage. OASE AquaMax Eco Classic pumps come supplied with a 10 metre power cable and all are covered by the OASE extended pump guarantee of 3 years standard with a free 2 year extension for a total of 5 years cover.